Background: Due to multi-drug, extended-drug, and pandrug resistance phenotypes, bacterial resistance to antibiotics and fungal infections are a general health issue. Particulary, increase of fungal infections due to secondary cause of human diseases have been observed. An extensive variety of benzimidazole derivatives have been characterized for their chemotherapeutic significance. Benzimidazole derivatives have received important attention because of pharmacological significance during current years, especially antimicrobial, anti-fungal, antitubercular, antioxidant, anti-Alzheimer's disease and antihypertension activities. 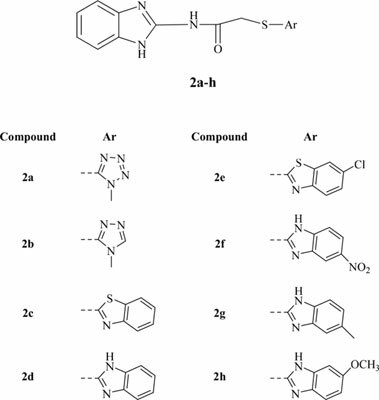 Methods: Some N-(1H-benzimidazol-2-yl)-2-mercaptoacetamide derivatives (2a-h) were synthesised and evaluated for their antimicrobial activity. The title compounds were gained by reacting N-(1H-benzimidazol-2-yl)-2-chloroacetamide with some substituted 2-mercapto heterocyclic rings. The synthesised compounds were investigated for their antimicrobial activities against C. albicans (ATCC 24433), C. krusei (ATCC 6258), C. glabrata (ATCC90030), C. parapsilosis (ATCC 22019), E. coli (ATCC 25922), E. coli (ATCC 35218), E. feacalis (ATCC 51299), E. feacalis (ATCC 29212), S. aureus (ATCC 25923), K. pneumoniae (ATCC 700603), P. aeruginosa (ATCC 27853). Results: The compounds showed high antifungal activity when compared with standard drug ketoconazole. In addition, all compounds (MIC 100 µg/mL) showed inhibitor activity against P. aeruginosa at two fold concentration of chloramphenicol (MIC 50 µg/mL). Also, compounds 2a, 2c and 2e (MIC: 50 µg/mL) have equal effect against E. coli (ATCC 35218) and more effective than other compounds (MIC of chloramphenicol: 100 µg/mL). Conclusıon: All compounds showed notable activity. Compounds have determined to possess higher antifungal activity than antibacterial activity. Additionally, compounds 2a with 1-methyltetrazole, 2c with benzothiazole and 2e with 6-chlorobenzothiazole moieties were found as the most active compounds. Keywords: Benzimidazole, azoles, antifungal activity, antibacterial activity, bacteria, fungi. Keywords:Benzimidazole, azoles, antifungal activity, antibacterial activity, bacteria, fungi. Abstract:Background: Due to multi-drug, extended-drug, and pandrug resistance phenotypes, bacterial resistance to antibiotics and fungal infections are a general health issue. Particulary, increase of fungal infections due to secondary cause of human diseases have been observed. An extensive variety of benzimidazole derivatives have been characterized for their chemotherapeutic significance. Benzimidazole derivatives have received important attention because of pharmacological significance during current years, especially antimicrobial, anti-fungal, antitubercular, antioxidant, anti-Alzheimer's disease and antihypertension activities. Mental Training for Cognitive Improvement in Elderly People: What have We Learned from Clinical and Neurophysiologic Studies?